Renu Desai confirmed getting engaged to the person who came into her life after the divorce with First Husband. 'The engagement ceremony has been completed long back. Though I mayn't give full details, I will surely inform everyone while getting married. It won't be a secret marriage. My whole family is happy with my decision,' she said. The Former Actress feels bad about the fact that trolling hasn't ended even though engagement happened months ago. She wonders why everyone is making a hue & cry over not getting married until now. 'More than Me, Others seems to be bothered about it. I will marry soon. It's a long process and we need to make necessary arrangements,' says Renu. 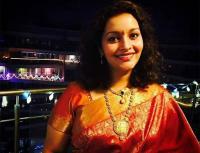 Renu Desai disclosed that her fiance is the Director of a Pune-based IT Company. He used to stay in USA until recently but shifted to Pune to take care of his ailing Father. She, however, refrained from disclosing his identity. Few weeks ago, Renu Desai made a public appearance touring the Kurnool District in AP. She interacted with Farmers for a TV Show aired on Sakshi Channel. × RELATED What About Renu Desai Marriage?